For a long time I used my inbox as a running to-do list. The problem was that I wouldn’t archive something until it was officially resolved and I didn’t need it anymore. Do you know how long the email for my graduation photos sat in my inbox because I didn’t really love the picture and therefore didn’t feel like ordering it? I don’t remember, but it was embarrassing. I didn’t realize until I stopped doing this how much having those old things sitting in there was clouding my brain space. Every time I needed to figure out what I had to do, I had to scan through all that junk that I had no real intention on taking action on anytime soon. You know how everyone and their brother has been going on and on about the new gmail tabs? Well, when that rolled around I couldn’t opt out of it fast enough. Why? Because for the first time ever, I feel like my inbox is not only under control, but it’s helping me be more productive. I’ve gotten to this point by using 3 tools, and I wanted to share them with you today. I was really skeptical about this. I didn’t want something sorting through my mail- what if it archived something that I didn’t want to, and then I forgot about it forever? Turns out I was just really misinformed about what it actually does. The Mailbox App allows you to snooze your email messages. Don’t need to deal with something until tomorrow/ next week/ next month? Snooze it. It’s the best, and getting to inbox zero every day is seriously the best feeling ever. My mind just feels clearer when I see that inspiring/ cool Instagram image that they feature each day, and my mind is quieter knowing that everything can wait until tomorrow. This is my first line of defense when it comes to my inbox. It filters out your subscription emails based on your preferences. If I had gotten Mailbox first I might not have needed it. However, I subscribe to a lot of things that I want to have if I want it, but I don’t necessarily need to read when they come in my inbox. That’s what this is for. It condensed all those emails into one summary email that it sends once a day. Any shopping or social media emails that I receive go there, as well as some other notification type stuff that just isn’t urgent. It definitely cuts down on the number of messages I have to sort through each day. If you feel like you can’t open your inbox without having five new messages, I highly recommend this! One productivity tip that I’m constantly coming across is to close out of your email while you’re doing work. My problem is that pretty much every project that I work on has some sort of crucial information housed in my inbox. I’m trying to get a better system in place for housing that info elsewhere, but for now, this does wonders. Basically, if you need to put your head down and not be interrupted but still need to be in your email, you just hit pause and go to work. It’ll store all your emails that you receive until you click unpause. You even have the option of setting up an autoresponder message, which is what I did when I was on vacation. The only problem with my system is that I don’t think you can “unpause” from your Mailbox app, but while I was on vacation this was actually great because I still had my phone to take pictures and Instagram and whatnot, but I knew that I couldn’t email. And I actually found a way to cheat because your emails still appear in the archived section of your inbox- but forget that I told you that! Don’t cheat! What are your favorite inbox tools? If you’re looking for more, check out this post! 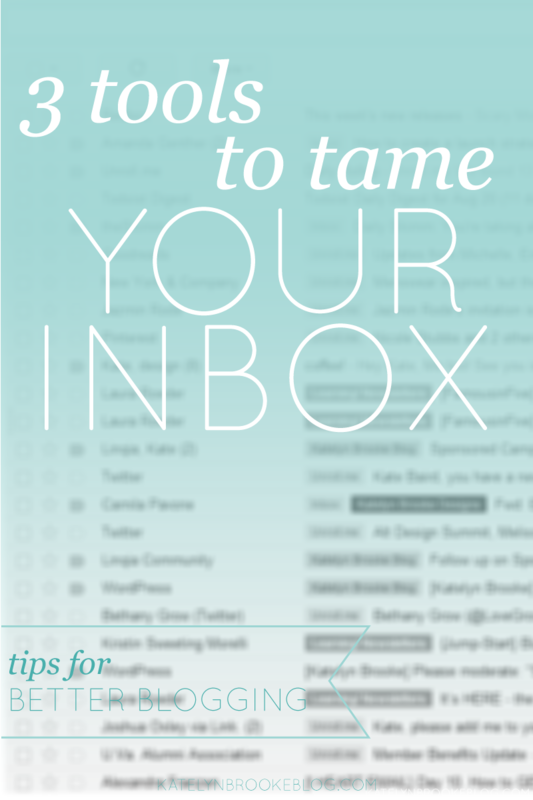 7 other tools to help with your inbox. *I’m sorry to everyone reading this who doesn’t have an iPhone (or iPad!) I know how annoying that is, but unfortunately the Mailbox App is only on those two devices at this time. If that’s you and you have another app or strategy for tackling your inbox, share it in the comments! P.S. Remember that survey I had you guys take? This week’s biz nugget is all about the results! Sign up to get the scoop. this does help! I have been using gmail and it sorts through your email and divides it by primary, social, and promotions but this looks like it is on another level. I love Mailbox — it’s definitely the best way to manage mail on the go! Surprisingly I’ve yet to use the snooze feature. And I’m fully aware of the cheat feature for Inbox Pause. Sadly, I end up peeking from time to time, but at least I don’t act on any of those emails! Great tips! My email is such a mess and it’s something I’ve been meaning to tackle lately. I will have to try that Mailbox app – sounds awesome! Snooze an email?! Love it! I chuckled when I read that. Good helpful tips! Much appreciated. How amazing are gmail tabs!! Love them. I tried mailbox but it just seemed like another app I had to keep track of. Decided to stick with the new gmail instead. Thanks for the heads up on Inbox Pause. I’m going to check that one out!